A blissful three whole days of no driving whatsoever under any circumstances was our reward for the arduous – by our standards, anyway – road trip from Brisbane to Sydney we’d just done. We were staying in Kingsgrove, inland of Botany Bay, on the edge of Wolli Creek; not that we were ever aware of a creek near us, but still, I just like to know these things. Sydney is never less than fascinating geographically; a city of flooded fractures. Driving the Bruce Highway gave way for us to commuting on the T2 Airport and Inner West line. Stations on the Sydney CBD end of the trip, like Museum and St James, conveyed a gloomy and London-like impression, which was completely at odds with the streetscape we saw looking out the window, shielding our eyes from the sun and straining upwards to see the brand names on the tops of the skyscrapers. Stepping out of the train carriage into the boiling hubbub of Circular Quay was a big moment in our trip. This whole driving holiday, after all, had started off as just an idea to drive to Sydney rather than fly there, which is what we’d normally do. With more time on our hands than we’d originally expected, we decided to extend the trip south of Sydney into the Snowy Mountains and Canberra, which we’d get to in a couple of days. For the meantime, after two days of driving and a half an hour’s train trip, we were at Circular Quay: ground zero of Plan A.
Alas, it was our bad luck to have driven to New South Wales during a heatwave. So be it. We could always duck into museums or department stores or the odd enormous Japanese bookshop should things get too much for Alexander and Eoin. We came here with them five years ago but were finding, on talking to them now about that trip, that they barely remembered a thing. The highlight then was taking a ferry under the Harbour Bridge into Darling Harbour to visit the National Maritime Museum. They did remember going onto the HMAS Onslow, the snub-nosed submarine, and also onto the replica of the Endeavour. There’d be no boat ride on the harbour for us this trip, though. Instead, we’d planned to pay a bit of attention to the Rocks, the original site of the fledgling settlement in 1788, and see if we couldn’t drum up a bit of ‘horrible histories‘-type of interest for Al and Eoin. After all, this place, which is now a bit of a theme park, with its Munich Brauhauses and its La Renaissance Patisseries, was rough as a badger’s arse about one hundred and fifty years ago, and it’s been our experience that they generally like their history on the rough-and-tumble side, the lads do. Thrown into shadow by the monster cruise ships almost permanently stationed at the terminal on the west side of Circular Quay, Cadman’s cottage, Sydney’s oldest building, and the statue of Captain Bligh are parts of the olde towne I wanted to show Alexander and Eoin. But they weren’t interested in that boring old stuff. In a lane called Suez Canal, well within earshot of the housey/jazzy/loungey/poncey music breezing over from the souvenir stands and cappucino joints, whalers and sailors were long ago waylaid by squatters and garrotters, and the Orange and Green Pushes (an old word for ‘gang’, one takes it) fought their turf wars. The lads perked up a bit at that particular piece of horribleness. The area we were in, we also discovered, had been the stage for a different sort of aggro much more recently. In the Rocks Discovery Museum we saw old black and white footage of disturbances between property developers and the locals and artists who tried to hold them back as they went about their business of knocking down some of the very oldest warehouses and lanes in the country to clear space for apartment blocks. Traditionally a working-class area, the protesters wanted to keep the Rocks affordable for proletariat Sydneysiders. We were respectfully mindful of the sacrifices people had made over the previous forty or so years to preserve the heritage of the oldest settled place in Sydney, but there was absolutely no way nowadays in a city like this one that any but the most well-off indeed were going to be able to afford to live so close to a world icon like the Opera House. The lads agreed before reverting to not being interested. In fairness to them, it was very hot, and we were planning on doing a fair amount of walking today, and they knew it. If you do have to walk around a big city in the heat, then down by Sydney harbour isn’t a bad choice. For a while, under the huge Harbour Bridge abutments at Dawes Point it was shaded and breezy enough to make us constantly hold on to our hats, and the smaller pleasure boats looked like they were getting bumped around a bit in the choppy waters. The sheer amount of traffic out on the water coming downstream on the Parramatta and back again was alarming to see. How do they not run into each other? One of the most conspicuous changes to the city’s layout since last we were there was Barangaroo Reserve, a reclaimed, and, sadly for us shadeless headland on the northwest tip of the Rocks. “The reserve returns this part of Sydney to the public for the first time in 100 years,” it claims on the brochures. They planted 75,858 plants. What’s incredible is not the number – for all I know, there are 75,858 plants in our back garden back in Brisbane – but that somebody counted them. Less alarming is the fact that there are 18 new place and road names within the precinct, nearly half of which are Aboriginal references, starting with Barangaroo herself who was a key figure in the Sydney Aboriginal community at the time of the colonial settlement. One of her husbands, Bennelong, gives his name to the outcrop on the other side of Circular Quay, of course: the one on which the Opera House stands. ‘Stargazer lawn’ is another of the reserve’s new names, and surely is a nod to nearby Sydney Observatory, one of my favourite sites in Sydney. But that wasn’t the end of it: according to the brochure it’s also the name of a fish found in Sydney harbour. Is that not a beautiful fact? Further down into Darling Harbour, the whole Barangaroo complex has given Sydney a new streetscape and someone has to pay for that. Keen that it not be us, we put off eating and kept walking, paying for our parsimony with a long diversion onto dreary Kent Street just to find a family restaurant, during which we all got crankier and sweatier. In retrospect, it might have been better simply to have splurged in one of the breed of middle-to-upper range Italian restaurants at Barangaroo than end up at Nandos, but we all know the game at this stage. 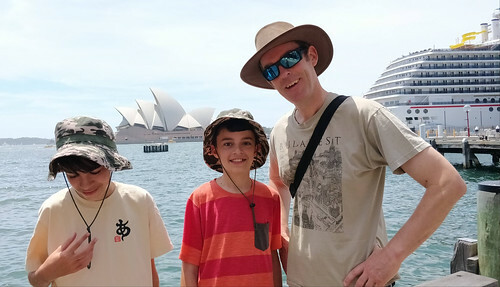 Family travel is an unending trade-off between seeing the sights and thrift, but for us Sydney isn’t about the food or the restaurants – it’s the harbour, the Rocks, Hyde Park, and the museums, in particular our old favourite the National Maritime Museum. We found out, to our amazement, that if you forego the Onslow and the boats out front entrance is free. If you’re lucky, like we were, you’ll arrive just as the 3-D ‘James Cameron – Challenging the Deep’ is starting. By all means, see the rest of the exhibits when the show’s over, but if you’ve just tramped the headland from Circular Quay, gone around Dawes Point, along Walsh bay, past Millers Point, then trudged along the construction zone at Hickson Road, grab a seat and give yourselves, and Sydney, a break for half an hour. It was later than we thought by the time we finished in the museum. Could it really be gelato time already? Somewhere near us, according to Google Maps, there was a highly-rated gelateria, awkwardly tucked away inside Star Casino, it looked like. We were barbarians circling a fortified city in which, it was rumoured, some of the best boysenberry coulis ice-cream, not to mention mango pancakes, in all the kingdom were to be found. Eventually we managed to breach the citadel’s defenses near a valet parking area and poured in, filthy, exhausted, and frightening to behold. Macadamia crunch was seriously considered, rum & raisin less so, but in the end it was coconut & lychee and pavlova special that was piled high on our tired cones, and with the taste still on our tongues we caught the light railway back through Chinatown and Paddy’s Markets to Central, and from there the T2 south-west out of the city, over Wolli Creek again, into Kingsgrove, then back home to flop down in peace, exhausted. At least there’d been no driving.